The secret to healthy skin? Vitamin E oil, of course! 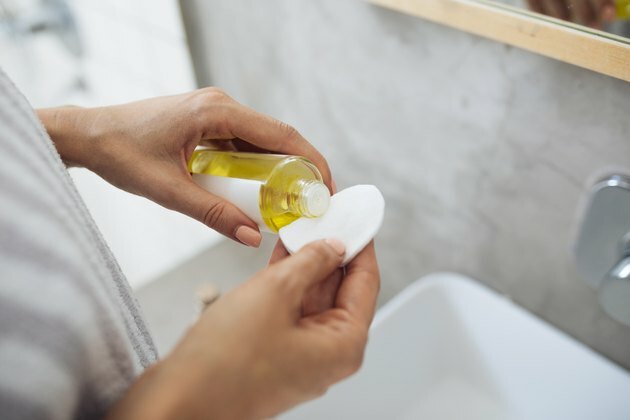 “Vitamin E as a skincare product goes back years, in fact, it sometimes gets overlooked when newer, more exotic-sounding ingredients are advertised in products,” says Tatiana Kononov, Revision Skincare's director of research and development. “But the truth is, it’s a highly beneficial ingredient for the skin, especially when it’s combined with other antioxidants.” This helps skincare products form what Kononov refers to as a "first-string defense" against free radicals and other environmentally damaging effects. Vitamin E is both a nutrient and antioxidant, and the oil in its purest form is extremely versatile. Known as tocopherol, it has a light brown/reddish hue and is used in many skincare products. You can find vitamin E at any drug or grocery store in either liquid or capsule form. Capsules can be punctured to release the oil for topical application. Also available, are products that contain vitamin E along with other ingredients made for skincare issues. Vitamin E is an important antioxidant for the skin. The National Institutes of Health Office of Dietary Supplements (ODS) explains that as an antioxidant, it helps neutralize free radicals, which damage cells and might contribute to cardiovascular disease and cancer, reactive oxygen species (ROS) formed in the body when it converts food to energy, and environmental exposures such as pollution and ultraviolet radiation. Although it's often debated in the wellness community whether or not vitamin E is effective for your skin, the ODS says some of its functions can be beneficial; including its function as an antioxidant and its roles in anti-inflammatory processes, inhibition of platelet aggregation and immune enhancement. Additionally, board-certified dermatologist, Anna Guanche, M.D., says Vitamin E is also known for its anti-aging and healing properties. You can find vitamin E oil for skin in many creams and lotions, most commonly in sunscreens, anti-aging moisturizers and skin brighteners. When purchasing a skin care product with vitamin E, Kononov says you should look for one that has vitamin E combined with other antioxidants. She recommends vitamin C and CoEnzyme Q10, as antioxidants work best in blends. Depending on what you're hoping to treat, there are different ways to use vitamin E. Here are some of the more common uses of vitamin E oil for your skin. Wrinkles come from age, free radical damage, improper skin care and poor habits such as smoking and drinking alcohol in excess. Vitamin E oil may prevent the formation of wrinkles by blocking free radical damage. According to board-certified dermatologist, Erum Ilyas, M.D., vitamin E applied to the skin does have an emollient or hydrating effect. "By hydrating the superficial layers of skin, it can minimize the appearance of fine lines and wrinkles," she says. "It's not necessarily ‘reversing’ the signs of aging, it is more likely hydrating the skin effectively to minimize the appearance of aging." Brown spots on the skin are caused by aging, free radical damage and poor liver function. Vitamin E oil prevents and repairs free radical damage. When applied topically to brown spots on the skin, it may help lighten and smooth the rough skin by lubricating cell membranes and encouraging cell regeneration. Pure vitamin E oil is also an effective treatment for dry, cracked cuticles. Dr. Ilyas says vitamin E can provide a protective barrier to your cuticles and hydrate the skin effectively. 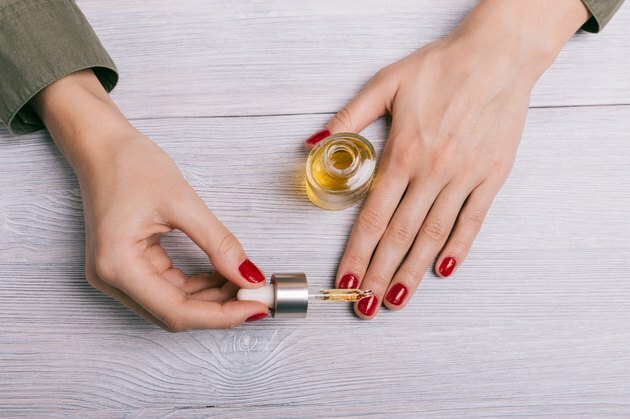 Applying a few drops of vitamin E oil to nails and cuticles helps to rehydrate and smooth them as well as prevent future cracks. Vitamin E oil for skin provides necessary moisture as well as antioxidants for intense healing. For cuticles, rough skin and dry skin, Dr. Ilyas says vitamin E can provide a protective barrier to the skin and hydrate it effectively. "Plus, it's generally safe, well tolerated, and inexpensive, making it a reasonable ingredient to look for in products," she says. At home, you can mix vitamin E oil with olive oil for smooth application and added therapy. Olive oil contains oleic acid, which makes skin more permeable and able to hold in necessary moisture. Just as vitamin E oil can help with rough skin, it can also help soften dry lips. However, since it's a heavy oil, Dr. Gauche recommends the cosmetic formulations and definitely oral supplementation as a first choice. You can find many over-the-counter products that contain vitamin E oil along with other moisturizing ingredients that help soothe and heal dry lips. The Mayo Clinic reports that skin reactions, including inflammation or itching, may occur with vitamin E applied to the skin. Dr. Gauche says it's rare for someone to be allergic to topical vitamin E.
"However, people with oily or acne-prone skin may find that it clogs their pores and makes their skin feel greasy," she says. This applies most commonly to use of the oil rather than the cosmetically elegant creams. You should call your doctor immediately if you develop a skin rash after a vitamin E supplement or skin allergy such as dermatitis. Additionally, you can see an allergist or dermatologist for treatment.